Small businesses and remote locations have long been thought of as soft targets for attackers. WatchGuard Firebox T35 and T55 tabletop appliances bring enterprise-level network security to those small office/branch office and small retail environments that matches the reality of today's distributed work style. Our unique product architecture enables smaller businesses to leverage best-in-class security services - from URL filtering and intrusion prevention to application control and data loss prevention - minus the cost and complexity of managing multiple single-point solutions. 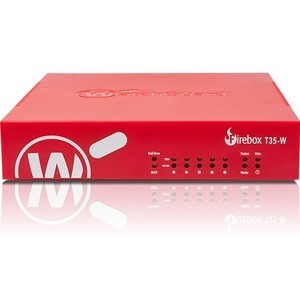 Firebox T Series appliances are not only easy to initially configure and deploy, they are also designed with an emphasis on centralized management, making ongoing policy and network management simple and straightforward. WatchGuard Dimension, which is included with purchase, provides a suite of big data visibility and reporting tools that instantly identify and distill key network security threats, issues and trends so you can take immediate preventive or corrective action. Security is complex, running it doesn't have to be.